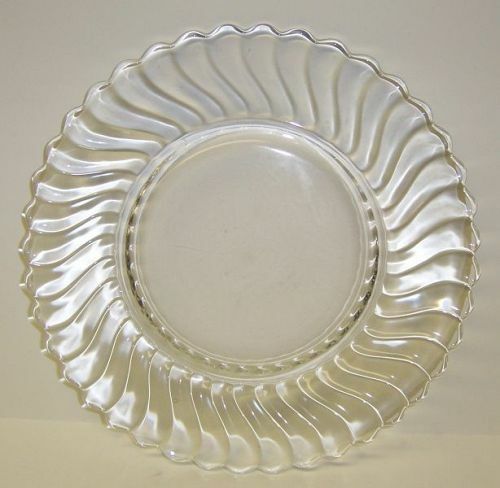 This is a really nice, crystal clear, Colony 9 1/4 inch diameter Dinner Plate made by Fostoria Glass. This Plate is in very good condition with no chips, cracks, scratches or cloudiness. Be sure to search our other Fostoria elegant glass available. We guarantee items to be as described. Be sure to search our other Fostoria Colony available. THANK YOU. This pretty crystal clear Colony 6 1/2 Inch High Flared Top Vase was made by Fostoria Glass. This Vase measures 7 3/4 inches in diameter at the top and is in very good condition with no chips, cracks or scratches. Be sure to search our other Colony available. We guarantee items to be as described. Feel free to email any questions. THANK YOU. 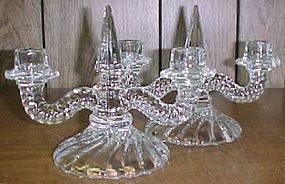 This really pretty pair of crystal clear Colony Double Candlesticks was made by Fostoria Glass. They each measure 6 inches high X 8 1/4 inches wide and are in very good condition with no chips or cracks. Be sure to search our other Colony available. We guarantee all items to be as described. THANK YOU. 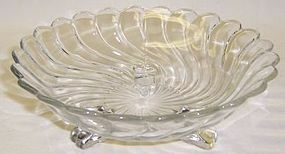 This pretty crystal clear Colony 2-Part Relish measures 9 inches from handle to handle and 4 3/4 inches across. It was made by Fostoria Glass and is in very good condition with no chips, cracks or cloudiness. That yellow streak is a reflection; it is not in the glass. Be sure to search our other Colony available. We guarantee all items to be as described. THANK YOU.